Jane Mansfield's Car Co-written & directed by Billy Bob Thornton. With Robert Duvall, John Hurt, Kevin Bacon, Robert Patrick. Two of the Warriors Three will be reprising their roles in,‘Thor 2′, Volstagg played by Ray and Hogun, played by Tadanobu Asano. Josh Dallas played Fandral but will not be returning due to prior commitments to the ABC series, 'Once Upon a Time'. 'Thor 2' is set to start production with Alan Taylor (Game of Thrones) directing. Also eturning will be Chris Hemsworth, Natalie Portman, Idris Elba, and Anthony Hopkins. Mads Mikkelsen is in talks to play the villain. Season 7 premieres Sunday, September 30th. On a sun-beaten afternoon atop the gleaming pool deck of the Trump Soho hotel in lower Manhattan, actors Logan Lerman and Ray Stevenson are reuniting for the first time since last November, when they wrapped The Three Musketeers, the 3-D rebirth of Alexandre Dumas’ standard-setting swashbuckler. Stevenson, a hulking, 47-year-old Irishman, clenches Lerman in a bear hug so tight it looks likely to cut off the slender 19-year-old actor’s air supply. Were Lerman’s smile not so bright, we’d be worried. 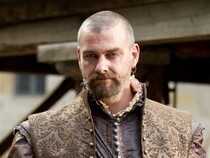 Actor Ray Stevenson has made it a point not to pursue any kind of public relations mission of celebritizing himself as so many of his colleagues have done. “One-for-all and all-for-one.” The hot-headed young D’Artagnan (Logan Lerman) joins forces with three rogue Musketeers (Matthew MacFadyen, Luke Evans and Ray Stevenson) in this reboot of Alexandre Dumas’ classic story ‘The Three Musketeers.’ They must stop the evil Richlieu (Christoph Waltz) and face off with Buckingham (Orlando Bloom) and the treacherous Milady (Milla Jovovich). Directed by Paul W.S. Anderson’s, the action adventure is given a state of the art update in 3-D.
Stevenson stars as Porthos in new movie The Three Musketeers, due to hit our screens today. And the 6ft 4ins actor will hardly be away from our cinema screens in the coming year as he has been filming a host of movies alongside some of Hollywood’s biggest names. Ray has been cast in Paramount’s G.I. Joe 2: Cobra Strikes as villain Firefly. The movie is the sequel to 2009's G.I. Joe: The Rise of Cobra. Ray will appear opposite Dwayne Johnson and Channing Tatum, along with Adrianne Palicki, Elodie Yung, RZA and D.J. Cotrona. The movie is being produced by Lorenzo di Bonaventura and will be directed by Jon M. Chu. Shooting begins at the end of summer in Louisiana and the release is slated for August 2012. Ray Stevenson along with Robert Duvall, John Hurt, Kevin Bacon, and Robert Patrick are set to star with Billy Bob Thornton in Jayne Mansfield's Car, Thorton's first dramatic feature since 2001's Daddy and Them. The film is being funded by AR Films, whose principal, Alexander Rodnyansky, will produce with Media Talent Group's Geyer Kosinski. Production begins June 22 in Georgia. Co-written by Thornton and Tom Epperson, it's a comedy with dramatic overtone, which revolves around the culture clash of two families, from different continents, in 1969.